The PXE zone is a SunOS Zone, which acts as a DHCP and TFTP server and is used for booting and installing compute nodes on the admin network. The network boot install script functionality is available from Danube Cloud version 2.6. Create an PXE zone. The disk should be large enough for storing one or two compute node USB images (at least 10 GB). 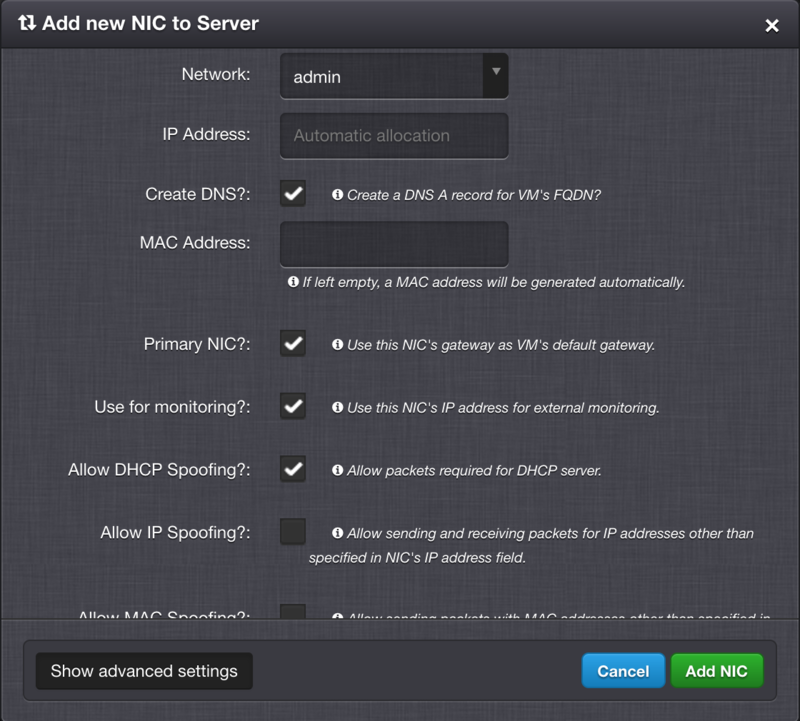 Add a NIC with the admin network and DHCP spoofing enabled. Install dnsmasq (for DHCP and TFTP) and nginx (for HTTP). Configure dnsmasq (DHCP and TFTP). Create the TFTP root directory. The defaults are fine, just change the document root for location / to something else. Installing a new compute node from the network. Note: installation of new compute nodes also requires additional files and configuration, which is explained in the next section. Download and unpack a Danube Cloud ErigonOS (SmartOS) platform archive. and the boot archive should be in /data/tftpboot/erigonos/<version>/platform/i86pc/amd64/boot_archive. This section describes additional steps required for installation of new compute nodes from the network. A working PXE boot environment including an ErigonOS (SmartOS) platform archive available via TFTP are necessary requirements for any network installation of Danube Cloud - this is described in the previous section. When installing a new compute node, please make sure that you always install the latest stable version. Download and unpack a Danube Cloud compute node USB image. Download a sample install script. Change the USB image download URL in the netboot_install_script.sh to the desired Danube Cloud compute node image. Update of the Danube Cloud software on both, the management server and all compute nodes. Update of the ErigonOS (SmartOS) platform archive and relevant iPXE script. In addition to regular upgrades of compute nodes, do not forget to check and update the Danube Cloud USB image used for installation of new compute nodes mentioned in the HTTP install files section.